Which black ink damages the Epson ink switch valve? Discussion in 'Epson InkJet Printers' started by W. Fisher, Feb 19, 2019. Which is guilty? 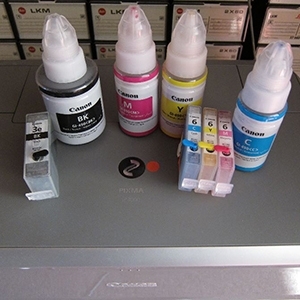 The Photo Black (PK) or the Matte Black (MK) ink that damages the shuttle valve in the Epson printers. I'm guessing it is the MK (Matte Black) maybe being a thicker ink doing the damage to that valve that switches between the two. If so, I'm thinking of maybe switching it out to a PK tank and tossing out the MK given I can make my own profiles. How do you know it is not a poorly designed part(s)? That's already a given knowing how many have had issues with that valve and the idiotic design behind their PK/MK switching system. I often think Epson designed it to waste ink with subsequent sales of more ink to feed it. 2. Ink dribbles and leaks. 3. Contamination of lighter-colored yellow ink from excessive leaking. 4. Wasting of ink for the switching. 5. Rapid filling of the maintenance tank. 6. Sludging of old and dried ink (MK?) around capping station and wiper. 7. Crud buildup beneath the print head's retaining frame. Epson really should have addressed it long ago, imho, but seems it passes on to later generations as if it is a good idea. hmmm... Maybe solvent related too. Dunno. Anyone take one of those PK/MK valves apart to see what goes wrong with them? Plugged up with ink crud, or maybe etched by some solvent? I’ve always found the debate on the Epson switch valve interesting but at the same time very dumb, so many guys have had issues with that stupid design, and some have even cut the wire to the switch so it couldn’t be switched accidently, but that meant you were restricted to just one black. I’ve always found the debate on the Epson switch valve interesting but at the same time very dumb, so many guys have had issues with that stupid design, and some have even cut the wire to the switch so it couldn’t be switched accidentally, but that meant you were restricted to just one black. I have a PK/MK 3880 valve (A new spare.) and it has four ports on one side and two on the other. I don't know what Epson is doing with that many lines (Six?) in and out of the thing. It's a bizarre looking thing, and Epson wrapped it with some protective tape over the two valve circular parts (I'd think they'd be sealed anyway? ), and the ports are separately covered too which seems normal for dirt. Maybe one could take the shuttle part of the valve out of the two round end pieces that it slides between, and seal it all up to make it feed both blacks. But the sheer number of lines going in and out of it might miss it up too. It's a weird setup. Looking at the drawing above, it looks like the selection lever pin pushes in on the shuttle valve. Whatever rubber (?) is used to cover and seal the sliding valve may get punctured or the seal broken causing the issue. If punctured I could see the reason for the leaking part, and maybe air and misfiring nozzles too. Cripes! Now my yellow is missing nozzles when just checked. Other 3880 is still okay, but the Cone yellow pigment one is now clogged. That's a new one as it's usually the blacks and magenta with occasional cyan not firing, but yellow?!!? stratman and The Hat like this. My personal speculation about the issue - and how to avoid it -is different and I posted it some time ago at dpreview. - switch the paper and ink just as you like. ..perhaps epson knows the answer, but they won't tell us.. The information of the parts whose product life is controlled is shown below. counter using the Adjustment Program. Changing the ink path by the Ink Selector cannot be completed during a predetermined time period due to a malfunction of the Ink Selector (its sensor or motor)..."
Many users report about the malfunction, but I've never read about an error message before. And I think in most cases the damage is caused by a defective or worn out sealing within the valve rather than by a defective of the selector itself, i.e. its mechanic parts.. Just speculating..but the longevity of sealing material may be less than of motors or gears.. (I admit I like to speculate)..."
- AND in addition do two black ink switches, from MK to PK and back again. Regarding the first quastion of the thread, I think MK could "dry harder" than PK, therefor I try to finish the procedure with MK online. Looking at the drawings it would be simple to bypass the Epson mechanism with two T tube Joiners and clamps to manually control the ink flow yourself, even when switching paper types, you’d still have the choice of which ink to use..
Never have a clogged valve again.. I'm thinking the easiest solution would be to dump the MK ink and fill that tank with distilled water and maybe a little alcohol. No way would it clog up the valve, unless some residual MK in the line got loose. I don't know about leaving the red-colored Piezoflush in the MK tank as it might contaminate the PK black should an accidental MK/PK switch occur. JayDecker and The Hat like this.